It’s time for another entry in the trying-to-keep-myself-from-making-this-mistake-all-the-time series. This location is also displayed in the default prompt. This path is used by PowerShell to resolve relative paths at the level of the PowerShell API. Applications have a notion of the current directory. This is the directory used to resolve relative paths at the level of the Windows API. Your current location may or may not be the same as your current directory. I told the out-file cmdlet to write the file foo.txt, and it create that file in my current location – c:\users\jim\documents. Make sense? This time I used the System.IO.File.WriteAllText static method, specifying the relative path bar.txt. 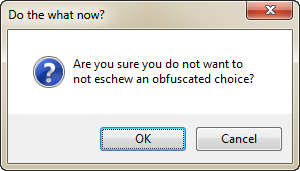 But the file was written into another directory! This becomes a problem when you use PowerShell to run an application or invoke parts of the .NET framework – the output doesn’t go where you’d expect it to go. Generally speaking, these things will work off of the current directory and have no concept of your current location in PowerShell. Line 2 gets the current location for the FileSystem PowerShell Provider. 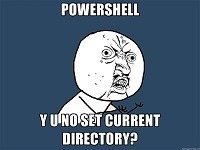 We have to specify the FileSystem provider because PowerShell lets you do crazy things like set the current location to the registry, and we can’t very well set the current directory to such a path. Line 3 updates the current directory so it matches the current location. This happens each time each time the prompt is written by the current host, so the current directory will be updated after each command. That means when you change location, the current directory will immediately follow suit. I think my favorite aspect of the MVP summit is the chance to reconnect with friends from all over the world and hear about the things they’re doing. The professional stuff is great, but I also love to hear how MVPs are using their skills to improve their communities. As it turns out, two of my friends from the Atlanta SQL community are putting together an all-day data warehousing training, with all proceeds going to the Cloverleaf School of Atlanta. Julie Smith and Audrey Hammonds are generously donating their time and expertise to dispel your data warehousing ignorance on March 14, 2013 in Duluth, GA. This is a rare chance to learn from two experts in the area while doing something grand for the community at the same time. For more information about this event – including the opportunity to donate to the school directly if you cannot attend – check out A Day of Warehousing with the DataChix to Benefit the Cloverleaf School. I’m happy to say that a new release of StudioShell is up, along with a new version of the StudioShell.Beta nuget package! In addition there are tons of itty bitty bug fixes and incremental improvements. This release is still classified as a beta. I want to collect usage information from VS2012 and/or PowerShell 3 users before marking the release as stable, and there are some documentation gaps that need to be filled. That said, the 1.5 release is still preferred over the existing 1.2 and 1.3.1 packages for stability and features. Oh, and I went ahead and started pushing the StudioShell.Contrib project. There isn’t must up there - at the moment it contains a few “helper functions” that I commonly use, and I will shortly push some Psake-related functions along with some contribution guidelines. My hope is that others will fork the project and contribute their own pieces.